Hooked hickory shaft is light (under 2 lb) yet strong enough to direct 1000 lb steers - it makes a great walking cane. Used by Ohio's oldest livestock auction right here in Kidron to load animals into trucks and stalls. Note: The non-slip rubber tip only comes with the 36"L Cattle Cane. Cattle Cane-36"L, comes with non-slip rubber tip. I got the 60 cane. It is a nice solid cane, and I've got a lot of positive comments on it from people. I find it aesthetically pleasing. However, it does not come with a rubber tip despite the description saying it does. For me it wasn't a big deal, since for $3 I got two 3/4 tips at Walmart that fit just fine. I think the rubber tip makes it much better for hard surfaces like paved roads, tile floors, etc. In another review, someone said the crook could not go around the neck of a sheep. I do not have sheep nor experience to say what their necks are like, but my own neck fits in my crook. Also, great job to Lehman's for prompt shipping! I'm very pleased with these. I have osteoarthritis, and use 2 canes to walk. Someone suggested I get some hiking poles which, they said, would ease strain on my back. I looked at some hiking poles; they were expensive, made from lightweight, collapsible metal tubing. My experience of collapsible tubing is, it collapses! Hickory won't do that - and I don't mind if a cane weighs a bit, as long as it holds me up! I purchased the 36 cane for my husband. He uses a cane to walk and is a large man. He trusts this cane not to fail him. Thank you for a great product at a great price. I ordered one of the 60 canes for myself, and once my Wife saw it, she wanted one too, so I ordered another one for her! 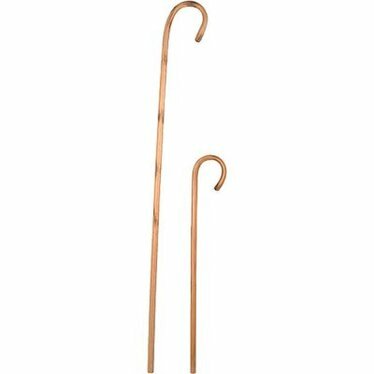 This is a solid no-nonsense well made hickory walking stick/shepherd's cane, ideal for nighttime trips to the outhouse while camping, or taking along while walking on country lanes where one might unexpectedly encounter undesirable wildlife. We will certainly feel safe when carrying them. Very dissapointed sheep farmer. It wasnt 6 feet long & the hook is so curved in that you couldnt possibly put it around the neck of a sheep. It's not a real livestock crook as represented in the ad. Its for a nativity show. On double check, it said 60 not 6', but it definetaly wont fit over the neck of any sheep or goat or dog on the farm except the baby sheep. I ordered two 36, and one 60. They are Fantastic! You won't be disappointed. Straight, hard, polished, and the short ones come with a rubber boot on the bottom. The long one is an outdoors cane and doesn't need a rubber boot.